To cross the road in Yangon, take it one lane at a time, even if the road is four lanes wide. Go slow and steady so cars can anticipate your movement. When possible, follow the lead of Burmese women crossing at the same time. There is power in numbers. In January, 2015, I learned how to cross the road in Myanmar while researching my new book, Burma Superstar. It was my first trip to the country formerly called Burma, and the trip would take me to its other major city, Mandalay, as well as its famous temple town, Bagan. I came across many of the country's quirks (like going through security on your way out of the airport). Yet the biggest impression of the trip was the pace of change within the country. This was especially true in Yangon. International hotels in Yangon during the high season (November through February) boast rates that surpass Bangkok. Office space here rents at a premium, too. And everywhere you go, everyone, even a street vender frying samosas in a wok propped over an open flame, has a smart phone. A country that never had reliable phone service skipped the step of installing landlines and went straight to cellular. If I had visited the country as recently as three years ago, I would be looking at a different skyline, one with fewer cranes. At the same time, much has stayed the same. Open-air tea shops serving concentrated tea sweetened with evaporated and condensed milk are still filled with mostly men during the day. Men and women alike wear a mix of jeans and t-shirts with traditional clothing—there are no signs that traditional Burmese longyis are going out of style. And a country that’s already filled with pagodas is still building pagodas. 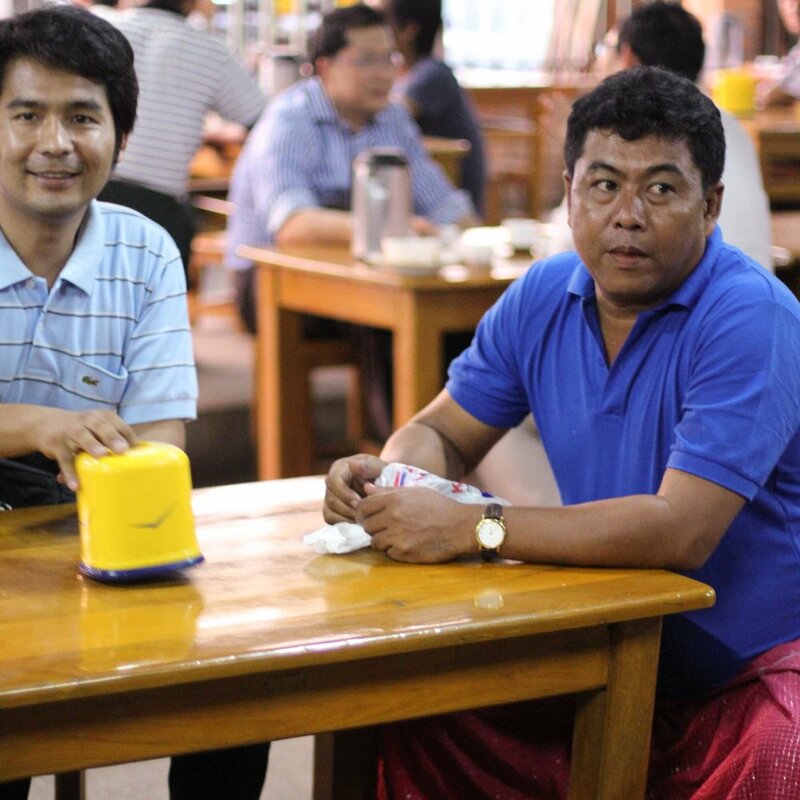 A popular tea shop in Yangon; the man on the right is an expert milk-tea maker and now travels to different tea shops training staff. On my first visit, Myanmar felt like new frontier, but of course that's silly: civilization has existed along the Ayerarwady River since the Bronze Age. Yet because a military dictatorship cut the country off from the rest of the world for more than 50 years, it can feel stuck in time. The colonial facades down Pansodan Street show the strain of tropical heat, but they also recall the time int he 1920s when Yangon was a booming city filled with immigrants. To me, parts of Myanmar felt strangely familiar. On our drive to Mt. Popa, an extinct volcano that is said to be the home of more than 30 Burmese nats, spirits, we passed rural farms that reminded me of the snapshots my mom took of our neighborhood when we lived in the southern Philippines when I was little. That's where I learned how to eat everything—rice, crispy fish—with my hands. Myanmar's rural areas looked like how I think I remember rural parts of the Philippines from 30 years ago. And then moments would jolt you back to the present day. On my second trip to Myanmar, in August 2015, I was a little less wide-eyed. At one stuffy restaurant in Yangon, we were waved into a small private dining room. The windows were closed, and in place of natural light was a pastel painting of an English country garden. Air condition blasted on our heads while the owner came in to talk about celebrities who had visited his restaurant. We picked at the Thai-Burmese fusion food. This meal was decidedly NOT at the restaurant mentioned above. Instead, it's from one of my favorite Yangon spots known locally as Rakhine restaurant, a restaurant focused on the seafood from Rakhine State. When the owner finally left, the general manager eventually warmed up to us and started talking about the United States. Turned out that he had lived there for years, first managing a sushi restaurant in New York City before moving to Tampa to work at a dry cleaners. He moved back to Yangon when his mom's health worsened. What did he miss the most about America? Three things: NFL, NBA, and Domino's Pizza. He was a Tampa Bay Buccaneers fan. The Burma Superstar cookbook comes out at the end of March. My goal when writing the book was not to glamorize an exotic country but rather provide a little peak into a place in transition through the lens of a restaurant from a Chinese neighborhood in San Francisco. Some of the recipes are traditional Burmese dishes, others are not. But like the general manager at that odd restaurant in Yangon, identities are fluid. And allowing for fluidity is more desirable than removing a country from the rest of the world for another 50 years, just so it doesn't change.